The One Man Crew Director from Redrock is a 36" motorized parabolic slider that lets you add cinematic motion to your video without needing a dedicated operator. It builds upon the design of the original One Man Crew, adding a re-designed low noise drive system for quieter slides, and new machined aluminum rails for even smoother motion with loads weighing up to 22 pounds. The slider also features remote control functionality, letting you setup and control the slider from your mobile device using Redrock's OMC Remote app. Additionally, the app can control camera start/stop recording when used with a compatible camera and optional remote cable. 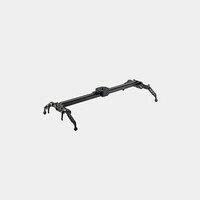 For a ready-to-use package, a Redrock Heavy Load Tilt Head is included along with an AC Adapter, D-Tap DC battery cable, a set of adapters for mounting the slider on light stands or c-stands, two cable wrangler clamps, and a padded carrying case. Benefiting small or single-person crews, the One Man Crew Director is quick to set up and easy to use thanks to intuitive controls and laser-assisted subject placement. It is able to capture nearly every shot typically found in interviews, including wide master shots, "two shots", and closeups. In addition to interviews, the slider is also well-suited to product shots, b-roll inserts, time lapses, or any shot where you can use a tripod. It can used to operate the main camera, a B-camera for closeup shots and inserts.